Only "small" projects will be described here. Nobody can expect to find an instruction for building a regulator. Though you can construct a lot with a small sortiment of tools. Most of the tools used can be found at better equiped homeworkers. I although could use an old lathe from time to time. The works described here may seem rude or primitive to professionals, but this is more dedicated to the interested homeworker. Any correction or advice is desired. Because the reels available in Austria (e.g. DiveRite) are quite expensive (700 ATS and more), I thought making one on my own shouldn't be a problem. The construction of most reels is really simple. 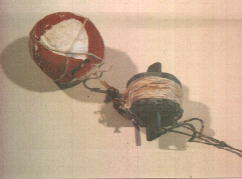 A spool with a rope and a knob put up to rotate it, are fixed at a U-type metal piece. The rope is lead through a rectangular opening at one of the thighs an knoted to a snap hook. Another L-type metal piece makes the handle. 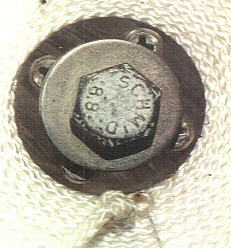 A screw with a big rotating knob is pressing at the reel to control the unwinding. The length of the rope varies depending on the use of it. 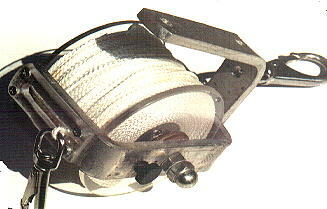 For cavediving you have different types of reels with 20m to 300m of rope. For wreckdiving you need only short length. The thickness should be 2-4mm. I chose 3mm rope from a hardware store in pieces of 50m. Because I wanted more than 50m I connected two leads in a way the thickness remains constant to avoid problems when unwinding. To get a rope in one piece you will have to buy much more length. Markings on the rope (distance, direction) are useful. 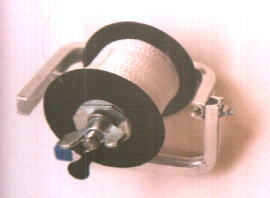 For the first modell I used the reel on which the rope is when I bought it. But these reels are made from weak material or have the wrong measures. So I started building one. I took Perspex(?) as material. It's good to work on and strong enough. Take a bar 40mm in diameter and 7cm long. Of course you can change the measures at your wish. Now drill throug the bar. This process is critical. First you need a long drill with 10,5mm diameter. Second this drilling has to be very much in the middle. That's best accomplished with a lathe. Another way is to fix the bar very accurately and then drill with a tripod(?)drill. The half way from either side. Then you cut two discs of 5mm Perspex with 114mm diameter and drill through the center with 10,5mm. To give the discs a smooth outside put them together fix them with a screw and nut. Thighten the screw int the drill and sand the discs at moderate speed. The discs will be fixed to the bar with small 4mm screws. For the rotating knob I used two small pipes which are mounted at the spool with a screw. The pipe on the outside is a bit smaller and can rotate. The one on the inside is fixed. An alu-bar with an rectangular shape is used for the U-type frame. Bend it in a vice. The opening for the rope will be best if you have a milling cutter. Some drills and filing it smooth will have the same effect. Then drill and make a thread for the axle in the middle of the alu part. A screw with discs and an O-ring gives a certain amount of braking when unwinding. Another thread next to the axle takes a screw whick blocks the unwinding when not in use. To protect the Perspex discs give contracting hose on the end of the screw. Now fix the L-type part with a screw and the main work is done. Drill some holes into the handle for mounting the reel with a rope. I also mounted a carabiner with a small eye. Matthias Heinrichs sent my this picture of his reel. And now some "quick-and-dirty" instructions for building a reel. I don't recommend it for long and deep cave penetration, but for training and simple dives it will do. The frame is made of alu profile which you can find in hardware stores to hang something on a wall. You can bend it easily in a vice. 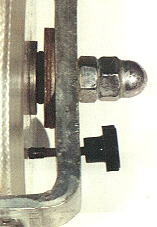 A bolt with nut connects both parts. Some holes serve for mounting. A longish hole leads the rope. Use a milling cutter, an angle grinder or otherwise drill holes next to each other and connect them with a file. 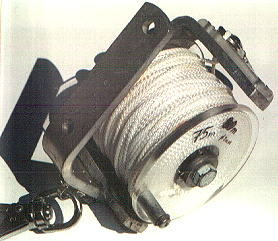 The reel is put on a M8 thread pole. A thread in the frame is useful but not necessary. The force needed to unroll the rope is controlled by a spring ring and a wing nut pressing onto it. To avoid interference with the reel grip I filed the wing nut at the ends. The thread pole is flattened and a metal plate with a matching hole stops the wing nut from rotating with the reel. Some wire through a hole in the thread pole fixes the wing nut. The longish hole should be protected with some tape to minimize the strain on the rope. 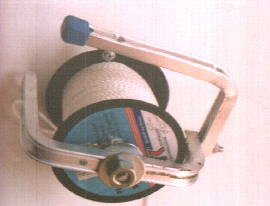 As reel is taken the reel the rope was sold on (2-3mm, 50m). As reel grip we use a furniture knob. The parts cost shouldn't be more than 150 ATS. Recently scissors instead of knives get popular. To cut a line it's surely a good alternative. But the commercial models were to expensive for me. 700ATS the more expensive one, still 270ATS for the cheaper one. This one gave the model I copied mostly. You need a webbing belt 50mm wide and about 1m in length, 7cm velcro 50mm wide and a scissor like the one on the picture. There are two pieces of webbing belt, one of them a bit longer. The exact measures depend on the scissors. The rough part of the velcro is sewed onto the end of the longer piece (1). Then make an u-type seam which connects the two pieces and forms a pocket for the scissors (2). 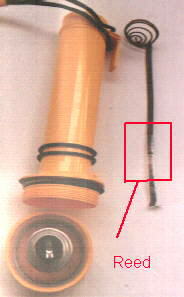 There is a place at the lower part for a plastic D-ring or an O-ring which is held by he seam (3). Seam (4) forms a loop to hold a strap. Seam (5) isn't necessary but gets a better hold. At last fold the remaining part at the end and sew the smooth part of the velcro (6). The measures at the plan are for one of the usual EMT scissors (other than at the pictures). 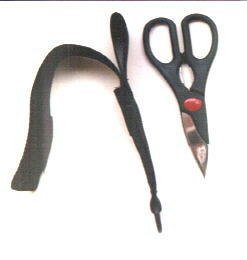 You can wear the scissors with two straps like a diving knive. Of course the scissors have to be stainless. Nevertheless it's good to use some grease for protection. One of the commercial scissors has got a cord to secure the scissors. But I think that would hinder the use. This is a marker buoy to fix a point underwater. I painted a styropor ball and knoted a coarse net around it to put a rope on it. 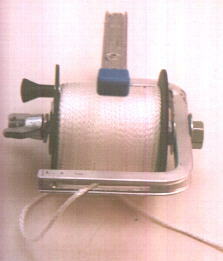 The reel consists of to brass parts solded together. Two tacks for fixation and to put the ball on. I painted the whole thing with zinc paint. 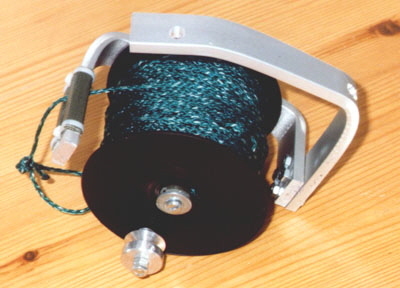 The reel serves as weight and holds about 50m thin nylon rope. A rubber band holds the ball on the reel. If you have the material it's a nice homework, but otherwise the fabricated ones are the better solution. Perhaps you thought about using a normal, cheap non-scuba flashlight for scuba. Most watertight ones are switched on by screwing the light head. These lights work OK as long as you are careful with the seals. But you shouldn't switch them underwater. So I added a switch. I cut the metal strip which leads to the lower battery contact and soldered a flat reed contact to the two ends. However it had to fit properly into the groove at the inside of the light. 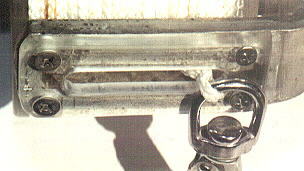 At the outside a magnet is glued to two O-rings. To switch the light on, you put the magnet in the right position. You have to be careful when loading the batteries not to damage the reed contact. It's not easy to find the right position to switch on. Most reed contacts especially with high currents get "stuck", which means even when the magnet is taken away the contact remains closed. You have to knock at the light to switch it off. For these reasons I don't use my lights of that kind anymore. Even the better price is nearly gone. This light costs about 100-150ATS while a light with switch by a scuba-supplier is under 300ATS.